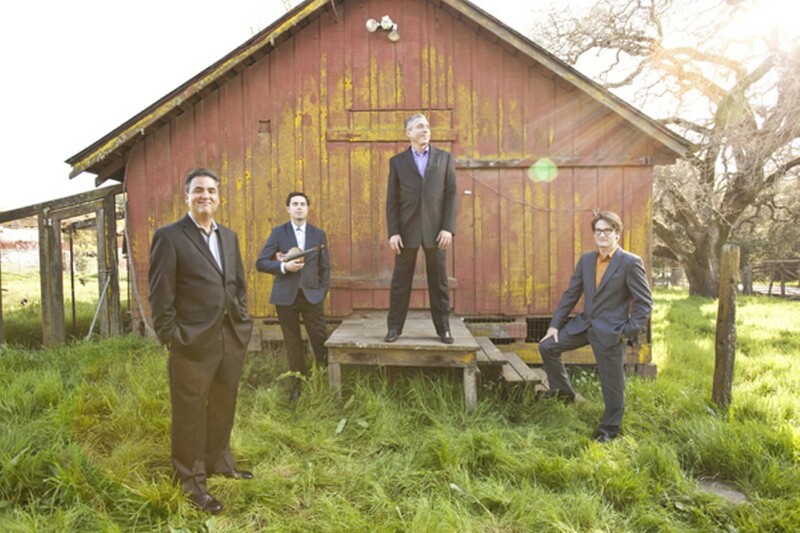 The jazz-influenced string quartet performs at Freight & Salvage. Turtle Island Quartet mostly draws its inspiration from jazz. After nearly thirty years laying down jazz backbeats, bluegrass rhythms, East Indian-influenced tracks, and Jimi Hendrix-inspired guitar riffs with European string instruments invented in the 16th century, the Turtle Island Quartet has made "alternative" and "crossover" obsolete terms. 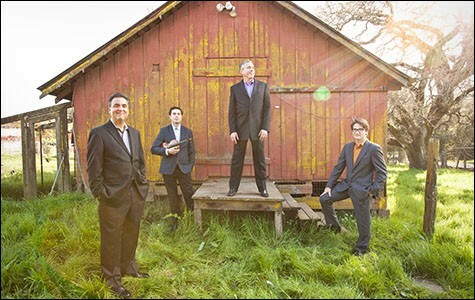 But for the "genre-bending" Bay Area string quartet, whose funky-meets-formal sound has won multiple Grammy Awards, owning an established style — as string-playing experimentalists — hasn't meant a reduction in energy. "Art music is always being redefined," the group's founder, David Balakrishnan, said. "When Stravinsky was writing, he was the epitome of alternative. People threw things at him, because his music wasn't fitting in easily." The only things thrown at Turtle Island Quartet lately are gigs and compliments. A January 25 appearance at the Esprit de Django et Stéphane Festival at Freight & Salvage will provide a rare opportunity to hear the ensemble locally. Recently retired Freight & Salvage Executive Director Steve Baker described Balakrishnan as "the vanguard," with "a genius for playing violin and composition." Baker first encountered Balakrishnan when he was playing with Rhythm Future, a tribute band dedicated to the work of violinist Stéphane Grapelli and guitarist Django Reinhardt, the founders of the Gypsy jazz sound that the festival celebrates. The then-twentysomething classically trained fiddler was already immersed in the music of the two French icons' legendary jazz band, Quintette du Hot Club de France. "I remember I had written a ton of music for a fantasy group; for a string quartet that could play classical and jazz compositions," Balakrishnan said about the years preceding Turtle Island Quartet's inaugural concert at the Freight in 1985. "I came in with such a head of steam, it was explosive. I had a way of playing jazz arrangements without drums. It was like a door was wide open and no one had ever gone through it before." Baker, a guitarist, remembers the audience as wildly enthusiastic. "We were just in awe of the musicianship," he recalled. "When we put this festival together, the idea was to give the violin equal billing to the guitar in the pantheon of jazz. David was the first person I thought of." Balakrishnan's first thought, upon agreeing to participate, was of admiring Grapelli at a performance long ago, in the early 1980s. Invited by David Grisman, a world-renown mandolin player and band leader, to sit in and play triple fiddle, Balakrishnan had tried to mimic his idol's playing style, which he says was at once airborne, like a ballet dancer, but also swung hard and was deceptively strong. "Grapelli stuck his tongue out at me. He didn't want that intensity. He didn't want me to play like him," Balakrishnan said, laughing. The experience shaped Balakrishnan into the "old lion[s]" he says he and founding member and cellist Mark Summers represent today. "We symbolize what an American string quartet sounds like," he said. "Other quartets are wonderful, how they take music from a classical perspective and play from a European style, but TIQ takes jazz as the tipping point." Listen to Summers play swing bass lines like a great jazz player, or Balakrishnan weave bluegrass chop into the artistic meat of a Latin American-tinged solo, and you'll understand how the heady swirl of immigrant cultures and musical influences equals "American." (Turtle Island Quartet also takes its name from the title of poet Gary Snyder's Native American creation myth-inspired book Turtle Island.) With Summer's passion for The Beatles and Balakrishnan's devotion to Hendrix — all clearly evident on tracks like "Because" and "House Burning Down" — Turtle Island Quartet seems like a complete package, even if present-day terms used to define them are elusive. After all, what is the alternative to "alternative?" Balakrishnan said the Bay Area's burgeoning jazz scene in the late 1980s drew musicians "like ants to sugar," and Turtle Island Quartet's history of revolving personnel represents constant evolution, not confusion. "We've had a lot of turnover during the almost thirty years, because we have mavericks — rebellious souls who want to move. The healthy influx of players have stuck and stayed. The Bay is an amazing string quartet pool." One constant, the Freight, has allowed his band to grow. "They've gone with stylistic integration," Balakrishnan said. "We were little babies when we started: this was our home. The Freight is brave. They stand for beauty, integrity, moving the wheel forward, exploring edges." And venues like the Freight have become crucial to musical groups' success, as record sales continue to dwindle. Today, a presence on multiple social media platforms and getting people out of their houses require fluid delivery systems and supreme effort. But live music, Balakrishnan insisted, still attracts audiences because "it's the best way to get your heart cleansed and feel gratitude for being alive." With Confetti Man, Turtle Island Quartet's forthcoming album, which is scheduled to be released in August 2014, Balakrishnan said the band is jumping off the Hendrix/Coltrane theme and returning to its wide-ranging roots. It's jazz, rock 'n' roll, classical, Celtic, Eastern European, film-influenced, edgy stuff, he said. He forgot bluegrass, but you can bet that vestiges of Grisman and blistering riffs harking back to violinists such as Jerry Goodman will make listeners' toes curl. At the festival, expect tunes from the quartet's Birth of the Cool album, which was inspired by Miles Davis, to bring the temperature down. "You can't make it too complicated," Balakrishnan said. "You just do what you do best and give people who you are."